Sometimes, it has been a long day. You want to meet up with your friends, grab a drink or two, chat. Perhaps you also want to do some sort of activity. Bowling is not your thing, you will wear your own shoes thank you very much. Darts are not all that thrilling. You do not feel like hitting up a driving range, or going to yoga. Nope, none of those are moving you to excitement. 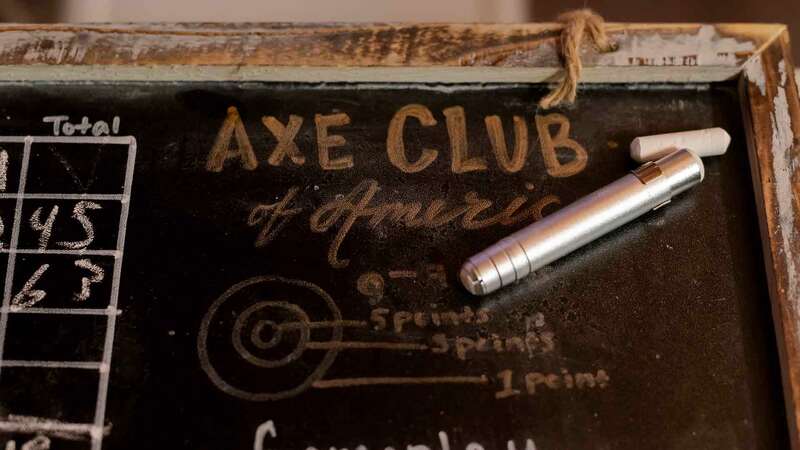 Instead, you hit up Axe Club of America. Yup, axes. Those will absolutely do the trick with the right mix of activity, competition, and socialization. Some of you may be familiar with this establishment, formerly known Lumberjaxe, Axe Club of America is in Plaza Midwood at 933 Louise Ave (right near Catawba Brewing Company). They boast that they are bigger and more satisfying than darts, and, I cannot disagree. Recently, I went with some girlfriends for a new twist on Girls Night. 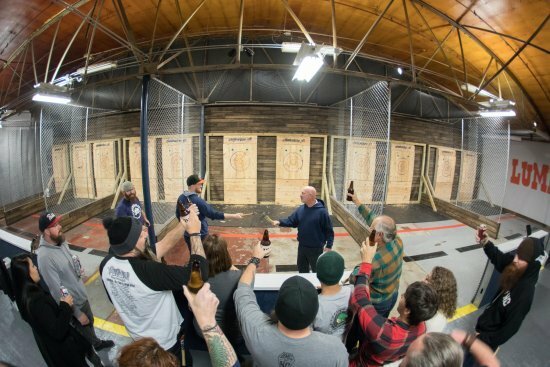 You can go to Axe Club of America for an array of reasons, renting space for corporate team building, special events, join a league, or just reserve a cage by the hour. Advice: BOOK EARLY! This is not really a place conducive to spontaneity as it is a hot activity so reservations are a must. We booked hourly and that reservation was good for up to 8 people. A professional Axe thrower (we called her PAT) shows you a few different ways to toss the axe and also gives you the ins and outs of staying safe. We listened intensively and then began to play! 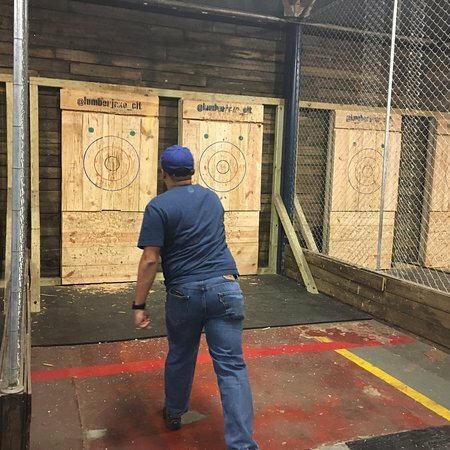 A match is when 2 people square off throwing their axes (over or under hand) at the target for three rounds of five axe throws per play. Score is kept and fun is had. This Cub is open to anyone over the age of 18 and those that are 21+ are also allowed to purchase adult beverages on site. The competition is intense so drinking was to a minimum, and they keep an eye on everyone closely to ensure safety at all times. What seemed like a bit of a daunting activity at first, ended up being a blast! We also brought quite a bit of attention (unintentionally) to ourselves being the only ladies group there… many of the men stopped by to say hi and ask our story. We got a few drink offers, so, if looking to mix up the dating pool, may not be a bad place to check out. Keep trying to book a slot and discouraged that it is all filled up? Fear not friends, there will be another location opening soon in Lower South End sometime this winter!